Canon is certainly one of the best manufacturers of cameras. They have produced lots of high-quality products on various price ranges, loved by many because of the performance and reliability. Now, for an entry-level mirrorless digital camera, Canon G7X and Canon G16 can easily get into your top priority. However, choosing between these two products is the tricky part. They each comes with each own strengths and merits, making them suitable for different conditions and purposes. Which is the one that will suit you best? See the comparisons below to find the answer! 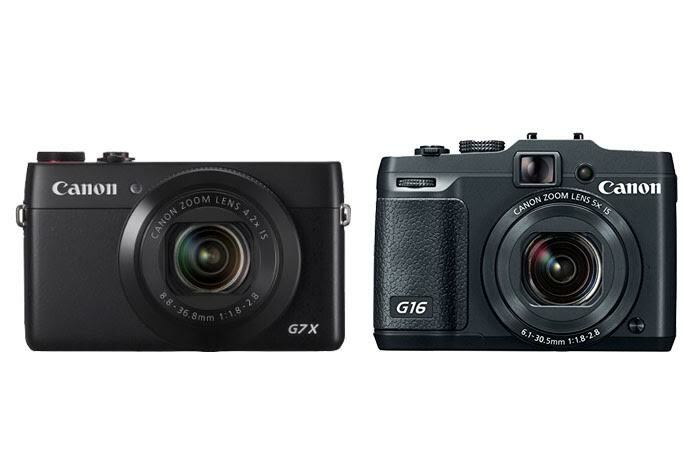 In terms of design, Canon G7X actually comes with a slightly lighter and more compact design compared to Canon G16. This is perhaps because Canon G7X comes with a relatively smaller lens and has no built-in viewfinder. The mirrorless digital camera comes with a smooth rectangle body that successfully showcases the elegance and classy looks. Furthermore, Canon G7X combines the quick and intuitive touchscreen control with a dial control for the easiest and most practical operation. Despite the smaller form factor, Canon G7X sports a 3.0-inch tiltable screen, which allows you to shoot conveniently from any angle. On the other hand, Canon G16 is a thud bigger and heavier. On the rear, you can find a 3.0-inch fixed display screen with button and dial control. You can also see an optical tunnel viewfinder on top of it. If you really prefer to work with a viewfinder, this is certainly a plus point. Besides having a slightly more powerful lens and an optical viewfinder – a feature that is rare to be found on a digital camera, Canon G16 can also give much better control to your hands with its 1/4000s maximum shutter speed and 80 – 12800 ISO range. As a comparison, Canon G7X only has 1/2000s maximum shutter speed and 125 – 12800 ISO range. You can be more creative and handle more challenging conditions with Canon G16. In addition, it also boasts a 12-fps continuous shooting speed. However, Canon G16 is armed with a 12 MP 1/1.7” BSI CMOS sensor, so it can’t exactly deliver large-sized images. It also may struggle to track moving objects due to only having 9 AF points. For this regard, Canon G7X boasts a 20 MP 1.0” BSI CMOS sensor and a powerful 31-point AF system. In general, Canon G16 makes a very good choice due to the controllability it provides. The built-in viewfinder also makes a strong plus point. However, if you need higher resolution or powerful AF, then you should choose Canon G7X.